Pollinators provide vital pollination services both to agriculture and to wild plant populations. The global value to agriculture alone is estimated at €153 billion in 2005. Managed pollinators are of particular value because they service the specfic needs of crop production, supplement the natural bank of pollinators and yet can be moved to sites as part of husbandry regimes to facilitate pollination. The honey bee (Apis mellifera) can be regarded as the most important commercial pollinator, responsible for at least 90% of commercial pollination. However, recent years have seen a global decline in honey bee populations, leading to concerns that the sustainability of agriculture and ecosystem service provision may be threatened as they decline. Honey bee populations are threatened by a number of endemic and emerging diseases including American foulbrood (caused by the bacterium Paenibacillus larvae), European foulbrood (caused by the bacterium Melissococcus plutonius), Nosema spp., the small hive beetle (Aethina tumida), Kashmir bee virus (KBV), Israeli acute paralysis virus (IAPV), Tropilaelaps spp., and the Varroa mite (Varroa destructor). These diseases have been spread by the global industry in honey bees and their hive products. Much of the decline in bees has been associated with specific diseases that have emerged in new geographical areas as a result of long distance movement, e.g. Varroa and Nosema ceranae. The movement and spread of emerging disease poses a real threat to bee populations that is difficult to manage because problems are often only identified after they have become difficult to eradicate. The global industry in honey bees and their hive products is expanding, leading to increased risk of the UK population becoming exposed to imports of exotic diseases and pathogens such as IAPV, Varroa and potentially the hitherto cryptic infectious elements of Colony Collapse Disorder (CCD). There is a need to be able to manage diseases to mitigate their impacts and also prepare for the invasion by exotic pathogens to help ensure the future of managed pollination services in the UK. Experimental work on the epidemiological processes involved in disease transmission in exotic bee disease is practically impossible. Bees forage widely across landscapes, quantifying individual disease processes at this scale is neither experimentally feasible nor ecological wise from the viewpoint of biosecurity. However there is a real need to develop methodologies for predicting the dynamics of disease and investigate likely methods for disease control. One approach is to investigate the epidemiology of a non-exotic disease for which there is extant data and use this as a paradigm for developing systems to investigate these and other potential exotic diseases. 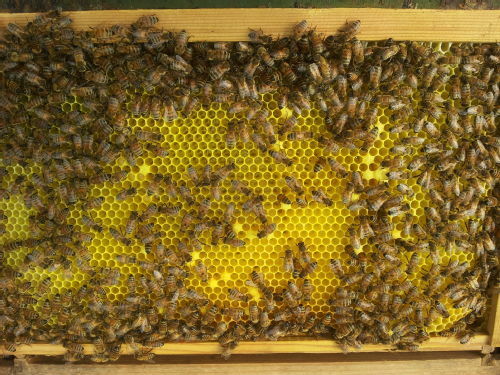 EFB is a serious statutory notifiable disease with a recorded incidence across 250,000 honey bee colony inspection records in England and Wales over the previous 10 years. EFB is also the most widespread brood disease in Great Britain and as such is a natural paradigm disease with which to develop generic modelling systems. EFB is an endemic disease of honey bee larvae caused by the notifiable anaerobic bacterium Melissococcus plutonius, a species most closely related to the genus Enterococcus. M. plutonius disease occurs on every continent where apiculture is practiced. Despite clear immediate impacts on honey bee health, the epidemiology of EFB is poorly understood. However, the reported incidence of EFB has been routinely monitored throughout England and Wales for 17 years and this provides a unique data set with which to develop modelling tools for managing EFB and other bee diseases. Researchers at Warwick are working with other scientists at the Food and Environment Research Agency (FERA), as part of the UK Insect Pollinator Initiative, in order to develop a framework for modelling transmission of EFB. As a precursor to this, a study has been carried out on an epidemic of American foulbrood (AFB) in 2010 on the island of Jersey, a small island off the Northwest coast of France. The dataset comprises of a census to every managed honey bee colony on the island in June 2010, with follow-up visits to infected apiaries in August of the same year. Information about each visit included: x- and y- coordinates, a unique owner identifier, the AFB status, the number of hives in the apiary, and a unique apiary identifier (to find repeat visits). The statistical analysis carried out on the data uses a Bayesian framework, incorporating a spatial SIR model with underlying owner network for simulating disease transmission from hive to hive. An MCMC scheme is used to determine all parameter values, including the model constants and infection times for both known and unknown ("occult") infections. The results reveal details such as the location and time of the initial infection of the epidemic. A stochastic SIR model is then used both to corroborate the results of the MCMC, and to simulate a suite of control strategies. The results of the analysis have been published, and the article is available here . 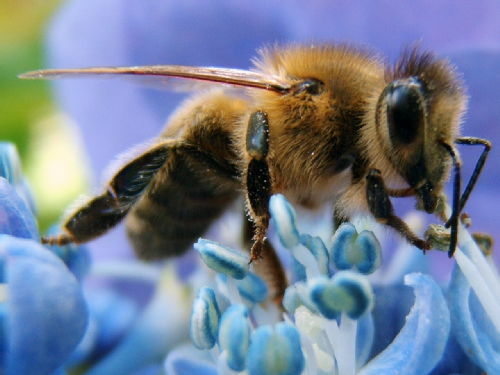 Image courtesy of Giles E. Budge, National Bee Unit, Food and Environment Research Agency. Funded by IPI initiative (BBSRC, DEFRA, Wellcome Trust), DEFRA.